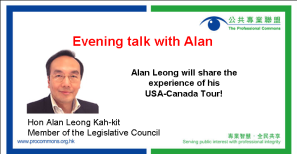 Alan Leong will share the experience of his USA-Canada Tour! 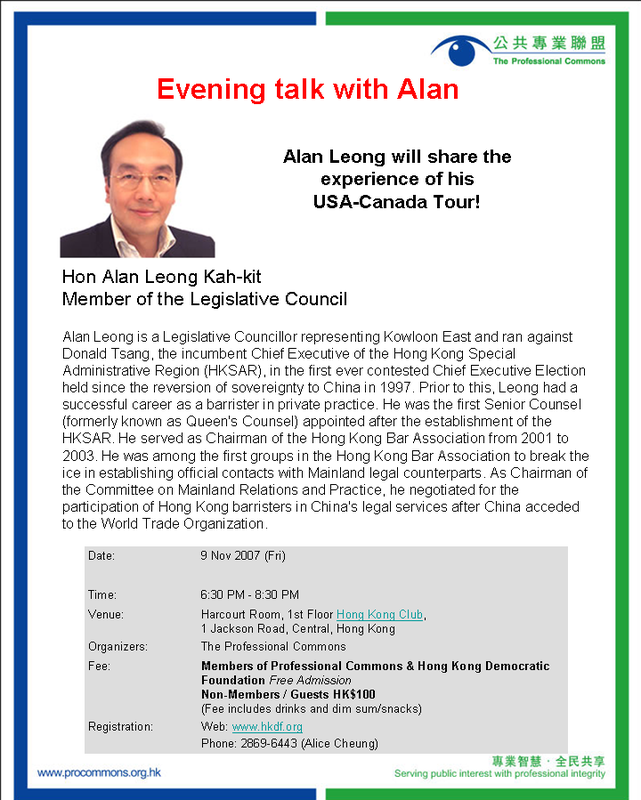 Alan Leong is a Legislative Councillor representing Kowloon East and ran against Donald Tsang, the incumbent Chief Executive of the Hong Kong Special Administrative Region (HKSAR), in the first ever contested Chief Executive Election held since the reversion of sovereignty to China in 1997. Prior to this, Leong had a successful career as a barrister in private practice. He was the first Senior Counsel (formerly known as Queen’s Counsel) appointed after the establishment of the HKSAR. He served as Chairman of the Hong Kong Bar Association from 2001 to 2003. He was among the first groups in the Hong Kong Bar Association to break the ice in establishing official contacts with Mainland legal counterparts. As Chairman of the Committee on Mainland Relations and Practice, he negotiated for the participation of Hong Kong barristers in China’s legal services after China acceded to the World Trade Organization.